Here’s a two-for-one winner – a casserole that you can make from pantry staples that also freezes well. 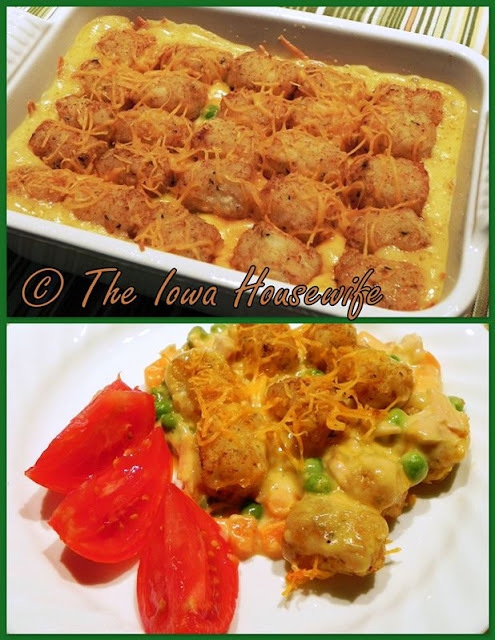 It's similar to the usual Tater Tot casserole that I used to make when I had children at home, but with a pot-pie like filling. This is a casserole that everyone, especially children, will like, and would be a good choice for community dinners and potlucks. In a large saucepan, combine the soup, milk and butter. Cook and stir over medium heat until heated through. Remove from the heat; stir in the chicken, peas, carrots and 4 ounces of the cheese. Transfer to two greased 8" square baking dishes. Top with tater tots; sprinkle with remaining cheese. Cover and freeze one casserole for up to 3 months. Cover and bake the remaining casserole at 350° for 30 minutes. Uncover; bake 5-10 minutes longer until heated through. To use frozen casserole: remove from the freezer 30 minutes before baking (do not thaw). Cover and bake at 350° for 1 1/2 to 1 3/4 hours or until heated through. Per Serving: 248 Calories; 18g Fat (65.3% calories from fat); 14g Protein; 8g Carbohydrate; 1g Dietary Fiber; 69mg Cholesterol; 520mg Sodium. Exchanges: 1/2 Grain(Starch); 1 1/2 Lean Meat; 0 Non-Fat Milk; 2 1/2 Fat.